Laboratorios Farmaceuticos ROVI is a Spanish speciality pharmaceutical company that has been manufacturing and marketing the medical device Fibrilin® in Spain and Portugal for more than ten years. The company is currently seeking partners to bring Fibrilin to new markets. Our in-house R&D core experience is in the field of heparin. We are fully integrated from manufacturing API to filling, packaging, marketing and distribution. Our portfolio includes Bemiparin (low molecular weight heparin, marketed in 52 countries through exclusive domestic distributors), heparin sodium (approved in Spain and updating dossier for EU countries) and Fibrilin, which is available in EU countries and countries where the CE mark is accepted. Fibrilin is the innovative catheter lock solution for nurses to prevent fibrin formation in both central and peripheral venous catheters and its consequences (phlebitis, infections, etc.) for hospitalised patients. It increases quality of life and reduces costs, with the minimum workload among available lock solutions. 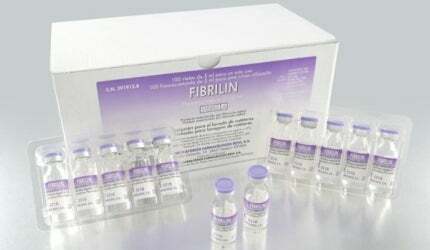 This is due to Fibrilin’s ability apply positive pressure to the blood stream. Effective and financially competitive, Fibrilin is the best solution compared to classic heparin sodium dilution multidose. Fibrilin is ready to market in EU countries and countries where the CE mark is accepted. The solution is currently marketed in Spain and Portugal, where we market the product ourselves. Fibrilin maintains catheter patency, avoiding fibrin formation and its consequences, including phlebitis, nosocomial infections, introduction of new catheters, thrombosis, extravasation and perfusion / aspiration. ROVI is seeking a partner that could position our product in an efficient way, and would hold the exclusive rights of Fibrilin in each country where Fibrilin could be marketed, except Spain and Portugal. Laboratorios Farmaceuticos ROVI is fully-integrated, profitable, Spanish speciality pharmaceutical company engaged in the research, development, manufacturing and marketing of small molecule and speciality biologic drugs. It was founded in 1946 and has been quoted on the Madrid Stock Exchange since 2007. 2011 revenues were €184.7m, and we have over 920 employees. If you are interested in our product or becoming a partner, please do not hesitate to contact us by phone, email or via the form on this page. Laboratorios Farmacéuticos ROVI, S. A.